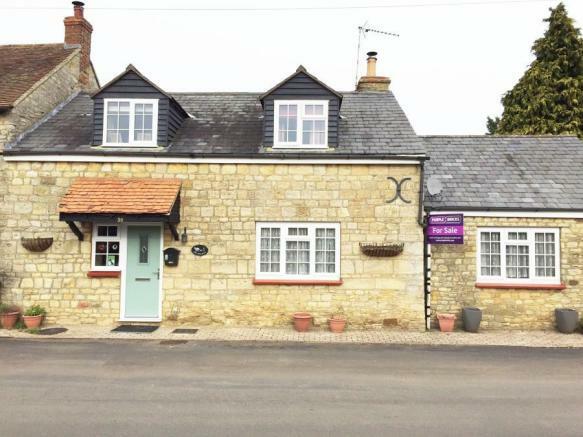 A very well presented, three bedroom, stone built character home. This charming semi detached property has been tastefully extended and modernised, and benefits from gas central heating. Briefly comprising: entrance hall, dining room, lounge, three bedrooms, bathroom, garage, parking and gardens. Viewing highly recommended. Range of base and wall mounted cupboards with work surfaces and single drainer sink. Rangemaster fitted range style oven with hob and extractor above. Space for usual white goods. Gas boiler and double glazed stable door to rear garden. Partly restricted headroom. Velux skylight and radiator. Partly restricted headroom. Radiator and window to rear aspect. Suite to comprise ball and claw freestanding bath with telephone style mixer tap and shower attachment, hand basin, WC and oversized shower cubicle. Ceramic tiled walls and floor. Radiator and skylight window. Enclosed rear garden with paved patio area, artificial grass and flower borders. Courtesy door to oversized brick built garage with power and light, and additional parking space. Disclaimer - Property reference MSS190029. The information displayed about this property comprises a property advertisement. Rightmove.co.uk makes no warranty as to the accuracy or completeness of the advertisement or any linked or associated information, and Rightmove has no control over the content. This property advertisement does not constitute property particulars. The information is provided and maintained by Taylors Estate Agents, Stony Stratford. Please contact the selling agent or developer directly to obtain any information which may be available under the terms of The Energy Performance of Buildings (Certificates and Inspections) (England and Wales) Regulations 2007 or the Home Report if in relation to a residential property in Scotland.